Let Kenerly Kreations add that extra sparkle to your costume! We provide custom rhinestoning services and use only the finest in swarovsky rhinestones. Provide us with your rhinestoning budget and we will disperse the stones accordingly within your budget. Don't know where to start? One of our sales staff will gladly provide you with an estimate from our head of rhinestoning, Kyong Wheeler. Kyong places her stones one-by-one and uses E-6000 glue to adhere. Here at Kenerly Kreations, we pride ourselves on being unique and innovative. We are constantly trying new color combinations and patterns. 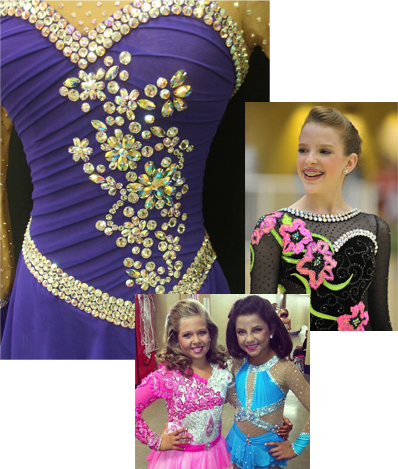 Let our rhinestoning separate your competition costume from the rest! "Thank you so much for making a beautiful outfit for Savannah. Every one loves it! This is a year savannah will always remember. It has been great twirling at the games and is a dream come true. The outfit has been luck to her and the players. Thank you!"